JV Mukama of the Ryerson Rams men’s basketball team and Kiera Van Ryk from the UBC Thunderbirds women’s volleyball squad are the U SPORTS Male and Female Athletes of the Week for the period ending Jan. 27, 2019. Going into the weekend with an air-cast on one foot, it might come as a surprise to see JV Mukama as the U SPORTS Athlete of the Week, but the Ryerson Rams standout dropped two of his best performances of the season against two of the best teams to earn the honour. On Friday night, Mukama netted 24 points and pulled in 11 rebounds to lead the Rams to a win over No. 6 Ottawa. He also added singles in the assist, steal, and block columns to round out an impactful 28 minutes of action against a tough, Top 10 opponent. Things didn’t get any easier from there for Mukama and the Rams, though, as the next night, they went into the Ravens Nest for a date with the undefeated Carleton squad. In that highly anticipated No. 1 vs. No 2 bout, Mukama played all 40 minutes and scored 25 points in the process (9-of-19 from the floor). He also tacked on five rebounds, three assists, and two steals to help Ryerson hand the Ravens their first loss of the season. 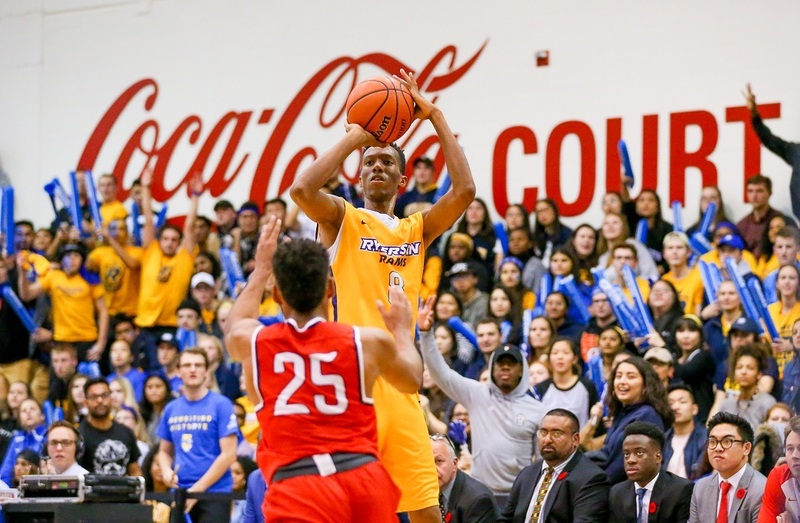 Mukama made his mark all game long, but perhaps his biggest play came when he hit a three-pointer with just 33 seconds left to play, giving the Ryerson a lead that they would defend until the final buzzer. The victory gave Ryerson its first No.1 ranking since Feb. 16, 2016 – ending a run of 39 consecutive weeks at the top for Carleton. @ubcwvb1's @kieravanryk on pace for 72 aces on the season (would be @CanadaWest record), holds the highest SA/S in league history (.80), WHILE on track for ~414 K on the season (would be 3rd in @CanadaWest history) AND current K/S (4.60) is 4th all time. Van Ryk, the 2018 U SPORTS Rookie of the Year, just keeps adding to her impressive numbers, as she helped lead the Thunderbirds to a weekend sweep over the No. 1-ranked Spartans in Langley, B.C., over the weekend, dropping just one set in the process. Van Ryk led all players with 17 kills Friday and posted a match-high five service aces while being credited with 22 points, as the ‘Birds handed TWU their first loss of the season. Saturday, the Kinesiology student put up 19 kills – more than double the next closest player. Van Ryk did so with an incredible .485 attack, while getting the job done defensively with seven digs. Van Ryk leads the nation in kills (345), kills per set (4.60), service aces (60), and total points (425.5).